Now, consider a cloud B identical in size to cloud A but approaching you over a curved arc in the sky slightly towards the left and at the same time. over a curved arc in the sky slightly towards the left and at the same time. 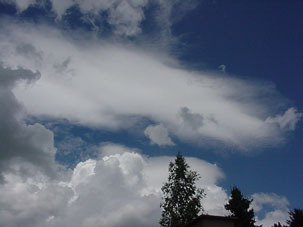 In this case the cloud will still follow a similar pattern as described in the previous example but to a lesser degree. It will not rise as far upwards. It will appear smaller. It definitely will not pass overhead. A further observation should be noted. The cloud will appear to move slightly to the left until it passes over the half way point and then begin to slowly move closer towards the other cloud as they approach the other horizon. It should also cover a shorter curved path. 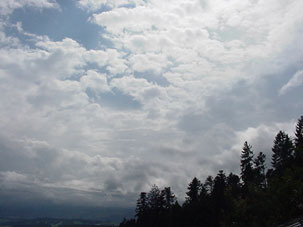 A cloud to the right of cloud A will follow a similar pattern to cloud B but remain on the right hand side of the cloud A and its path. AGain, this requires practice.